The two most common types of crickets found on Long Island are House Crickets and Field Crickets. Each of the two types are convenient names, yet both can be used to describe more than 25 different species. Infestations can sometimes controlled with over-the-counter products, but a trained professional can help you to get rid of crickets for good. The size and look of every cricket varies widely according to the species. The most common features of any cricket are long, thin antennae and long hind jumping legs. Most are active at night and some are attracted to light. They eat anything plant or animal based. They typically dwell under rocks and logs. 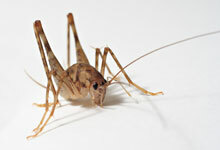 Not only will field crickets harm a garden, they can also damage furniture, clothing, and rugs. Seal up any crevices in your basement, garage, and crawl space. Keeping our grass short and removing weeds can also keep them away from your home. Crickets seem fairly harmless compared to other pests that invade the home, mainly because they have little to no interest in living indoors. However when they do get in by accident, they will invade in large numbers and cause a lot of damage. They are also very resilient since they can live on a variety of food sources. Crickets also use their chirp to attract mates. This noise might be pleasant indoors, but can be quite a nuisance when it becomes loud enough to disturb sleep. If you are in need of cricket extermination on Long Island, Pest Pro is the professional extermination team for you. If you are experiencing a Cricket Infestation in the Long Island area contact the experts at Pest Pro Exterminating!